The following article is a guest post. If interested in submitting a guest post, please read my guest posting policy and then contact me. One of the biggest quandaries about sending your son or daughter to college is how to pay for it. If you don’t have a college fund built up, it can be daunting. Even if you have one, it might be difficult to keep up with the pace of raising tuition and college costs. According to the National Center for Education Statistics, the price of an undergraduate college education rose 31 percent at private institutions and 42 percent at public ones between the 2000 school year and the 2010 school year. Every year, parents and their college-bound students are having to get more creative about how to pay for it. If you’re already in that group, there are some options available. You may be able to swing it based on a combination of student loans, scholarships or grants, savings and some careful planning. Of course, which school is chosen and how many years it takes to graduate are significant factors in how much it will cost. The College Board estimates a “moderate” college budget at $22,261 for in-state public universities for the 2012-2013 school year. The figure for private universities is nearly double that at $43,289. It’s all right to put a limit on which schools your child applies to, even if they think it’s the end of the world when you say no. If finances are a real issue, set a cap for tuition and room and board. With help from student aid, scholarships and grants, the high end of your cap may be attainable. The best things in life are free. That includes free money for school in the form of college scholarships and grants. Anything you don’t have to pay back should be at the top of your list. The number of available scholarships is mind-blowing, but they all require time and attention to get them. This is when you sit down your son or daughter and explain that you’re sending them on a mission to find scholarship money. It’s not all based on grades anymore, although good grades can help. Financial need is another important factor in eligibility. Students who have already chosen a field of study can look at major or career-related opportunities. Sports scholarship awards are a possibility. Another option is your child’s ethnic background. Money is available not only for minority scholarships, but also for students with a specific heritage. Social organizations and religious affiliations are other sources of scholarship money. It’s worth the time and effort to check out any that fit the eligibility mold and apply for as many as possible. There are different types of student loans, the most common ones are from the federal government and those from private lenders. The interest rates are lower than what you’ll find for standard personal loans, but they do have to be paid back. A few things to keep in mind when it comes to student loans are that the amount of interest can be affected by who the borrower is, when the payments start and whether the payments are made on time and in full. A parent co-signer on a student’s loan can lower the interest rate. Students making interest payments will wind up paying less. If you started a college savings fund early on, there is probably some money for school available. Invite your child to contribute early and often. There are some banks that earmark a minor’s savings account differently so that there is no minimum balance requirement, although the child may not be allowed to withdraw the money without a parent or guardian’s permission. Another option is to set up a 529 savings plan. There are both state and federal plans available. For most state plans, you don’t have to be a resident and the student doesn’t have to go to school in that state in order to qualify. When it comes to paying for college, it’s always important to have your rising college student fill out the financial aid forms and other paperwork that will get their foot in the door. When you use a combination of different types of funding and have a plan on how to put it all together, even the most expensive college education can be attainable. As a bankruptcy lawyer and recent graduate I highly recommend not paying a lot for college. Rather than focusing on the reputation of a school, focus on the market value of a particular license. Once you have a license in mind choose one the cheapest schools that offer a degree necessary for that license. A friend of mine did this and makes over 80k a year, has a masters degree, and spent approximately 40k for college. Don’t be indebted for the rest of your life on speculative future earnings. 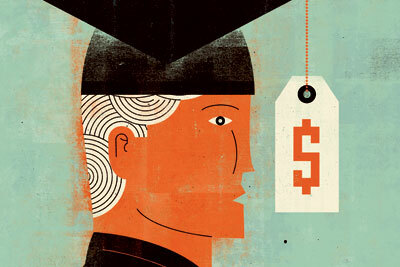 Choose a cheap college and earn a marketable license. Great points Adam, unfortunately a lot of kids these days feel entitled to going to college regardless of cost and field of study. A cheap college can be just as fun as an expensive one and you’re right, the degree you get will be just as valuable. My company hires just as many, if not more state school grads than the top tier UC grads where I went(California). After getting our son thru undergrad (ALL on our dime (except his little part time jobs) – with plenty of extra-curricular activities, study abroad, travel abroad, private pilot’s license, etc) he decided to go to law school. So I told him flat out – your mom and I are paying off our mortgage and fully funding our retirement. Law school is going to be on your own dime – get a frickin scholarship. I think I scared the hell out of him – ha! But it worked. That kid got a full ride scholarship to law school in NY. Amazing what kids are capable of doing if/when the parents just stop coddling them. Wow that’s a great story, as soon as I saw law school I thought uh-oh but I think you guys definitely made the right decision. I understand why people take out huge dumb loans when they’re 17/18 but by the time you’re 22/23 you should know how expensive law school can be and it should be on you to pay it back. Nice article. Costly degrees always do not guarantee expertise but carry values!